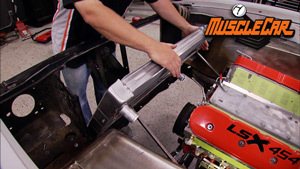 The 1974 Pro Street Dodge Dart, gets a roll cage installed to spec. Also, the guys work up some sheet metal tubs for the Dodge's gigantic racing slicks. It's the birth of a new Mopar project as Rick and Tom set their sights on an old Dodge, in the hopes of turning it into an Earth-shattering superbeast. 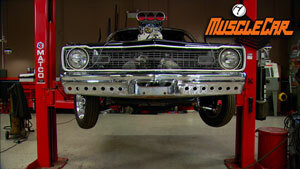 Our Pro Street Dodge Dart, gets the once-over with lots of final details. 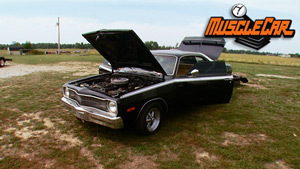 The 1974 Pro Street Dodge Dart, undergoes body and paint work, along with custom graphics. The guys visit a Mustang and Shelby outing at a road course. 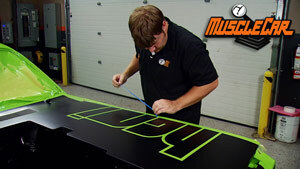 The Pro Street Dodge gets floor prep and wiring, along with custom-built aluminum interior panels. The guys also head to the world's largest Shelby & Ford show. It's how-to that you asked for, as the guys tackle projects that we got e-mails about, with affordable and manageable do-it-yourself how-to. 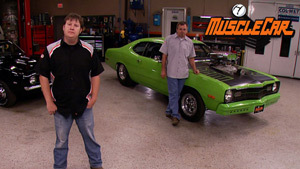 The Pro Street Dodge Dart gets a fuel system, and the guys go over safety equipment. Our Pro Street Dodge Dart, gets floors and monster-sized wheel tubs burned in, then the guys do some custom bumper mounting and a one-off exhaust for the Dodge. 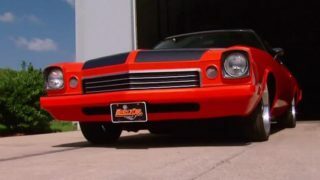 The Pro Street Dodge gets a gnarly-looking blown Hemi wedged into it's engine bay, and the crew gets help from a guy that helped build some of the world's most famous cars. 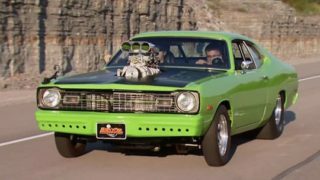 The Pro Street Dodge Dart, Project Business Time is ready to roll! 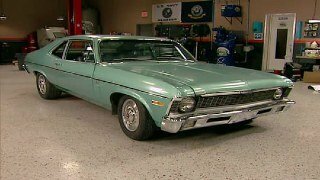 Learn how to lock down your drag tires with a set of rim screws, then Flashback looks at another classic Dodge. Then, Business Time is ready to hit the track! (ANNOUNCER)>> TODAY ON MUSCLE CAR, IT'S THE RIGHT WAY TO BUILD A FULL RACE READY TEN POINT ROLL CAGE FOR OUR DODGE COMPLETE WITH SWING OUT BARS. 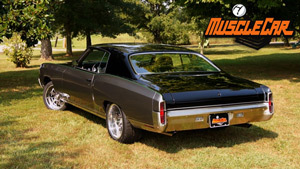 PLUS WE'LL HEAD TO AMERICA'S ULTIMATE MOPAR BONEYARD FOR ORIGINAL PARTS FOR OUR COMPACT DART. DART, PROJECT BUSINESS TIME. THIS CAR'S GONNA BE A BLOWN WHITE KNUCKLE STREET/STRIP ABODY WITH BIG POWER AND MASSIVE RUBBER. 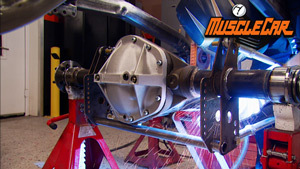 (RICK)>> NOW IN THE PROCESS WE CUT A LOT OF SHEET METAL AND BRACING OUT OF OUR DODGE. SO TO KEEP IT FROM FOLDING UP LIKE ORIGAMI GOING DOWN THE TRACK WE'VE GOT TO GET A FULL ON CAGE PUT IN THIS THING. S&W SENT US EVERY TUBE THAT WE NEED TO KEEP US UP TO SPEC. (SCOTT)>> THE CAGE THAT WE'RE GONNA PUT IN THIS DART IS ONE OF OUR 10 POINT KITS THAT'S MADE OUT OF .134 WALL INCH AND FIVEEIGHTHS TUBING. NOT ONLY DOES IT MAKE THE CAR SAFER, BUT IT STIFFENS THE CAR UP, TIES EVERYTHING TOGETHER. LIKE WE DID BACK HERE. THE REASON YOU WANT TO WELD ON THE PLATE IS IT ACTUALLY BROADENS THE JOINT, GIVES YOU A LITTLE MORE REINFORCEMENT CAUSE IF YOU WELD IT JUST RIGHT AROUND HERE, IT COULD RIP OFF ON THIS THINNER SHEET METAL. (RICK)>> NOW THE FIRST THING WE'VE GOT TO PUT IN THERE IS THE MAIN HOOP. WHY, CAUSE EVERYTHING GETS ATTACHED TO IT. RIGHT THERE'S WHERE THAT BAR'S GONNA COME IN CONTACT FIRST. NOW IT'S TIME TO ATTACH THE MAIN HOOP TO THE STRUCTURE OF THE CAR. NOW TO DO THIS WE'RE GONNA USE THESE OUTRIGGERS OVER THAT WE ADDED. NOW THE WALL THICKNESS OF THESE IS ADEQUATE TO ATTACH THE ROLL BAR DIRECTLY TO IT. THAT MEANS WE DON'T HAVE TO ADD THE PLATES. BUT IF YOU WERE MOUNTED TO, SAY THE FLOOR, THEN YOU DO HAVE TO ADD THE PLATES, THAT WAY YOUR THICKNESS IS UP ENOUGH TO MEET SPECS. IT NEVER HURTS TO DOUBLE CHECK YOUR MEASUREMENTS TO SEE THAT YOU'RE STILL SQUARE BEFORE YOU TACK YOUR TUBES IN. (TOMMY)>> NOW WITH RICK PROPERLY INSTALLED IN THE CAR, WE'VE GOT TO DO A MEASUREMENT BETWEEN THIS BACK BAR AND THE BACK OF HIS HEAD CAUSE YOU WANT IT TO BE WITHIN SIX INCHES OF YOUR HELMET. (RICK)>> COME ON, LETS HEAR A COMMENT NOW ABOUT MY BIG HEAD. (RICK)>> I KNOW IT'S COMING. TO ADD IN THE THICKNESS OF A HELMET PLUS HIS EGO, WE'RE WELL WITHIN SIX. NOW WE NEED TO DETERMINE THE HEIGHT OF OUR REAR SEAT BAR. YOU WANT IT FOUR INCHES BELOW YOUR SHOULDER. NOBODY MOVE AND NOBODY GETS HURT. A RUBBER MALLET DOES A GREAT JOB OF MESSAGING THE TUBES INTO PLACE, THEN IT GETS TACKED IN. (RICK)>> WE'RE READY TO PUT DOWN OUR REAR BRACES BUT WE'VE GOT A LITTLE BIT OF SHEET METAL STILL IN THE WAY HERE. BUT THAT'S ALL RIGHT, IT'S NOTHING THAT A SAW AIN'T GONNA FIX. PROBLEM SOLVED! NOW THESE BRACES ARE GONNA RUN FROM THE REAR FRAME RAILS ALL THE WAY UP TO THE MAIN HOOP. NOW WITH OUR ANGLES MARKED WE CAN CHOP ON THESE AS WELL. (ANNOUNCER)>> AFTER THE BREAK THE DODGE GETS A TOTALLY TUBULAR TREATMENT. BUSINESS TIME GETS BUILT UP INSIDE LIKE A FORTRESS, AND ARE YOU LOOKING FOR SOME DODGE OR PLYMOUTH PARTS? YOU MAY WANT TO TALK TO THESE GUYS! (RICK)>> HEY GUYS, WE'RE ABOUT KNEE DEEP INTO ROLL BAR TERRITORY HERE WITH OUR DODGE DART. I'M GETTING ALL THE TUBES CUT AND FIT THAT'S GONNA ATTACH ON TO OUR MAIN HOOP. NOW THESE REAR BARS, I'M GONNA TACK THEM INTO THE REAR BUT NOT THE FRONT. I'LL EXPLAIN WHY IN A SECOND. (TOMMY)>> WE'VE GOT OUR HALO CUT AND NOTCHED AND READY TO WELD ON TO OUR MAIN TUBE. NOW THIS THING SERVES A COUPLE OF PURPOSES. IT ATTACHES THE FRONT BARS TO THE MAIN HOOP AND IT HELPS PROTECT THE ROOF FROM CAVING IN JUST IN CASE YOU TRY TO MAKE IT DOWN THE TRACK ON YOUR LID. (RICK)>> NOW I'M NOT GONNA TACK THESE BARS TO THE MAIN HOOP QUITE YET BECAUSE I STILL NEED TO COME IN HERE WITH THE HALO. NOW I NEED THIS IN PLACE THOUGH SO I CAN GET THE HALO IN THE RIGHT POSITION. NOW ONCE IT'S TACKED, I'VE GOT TO LEAN THIS FORWARD TO WELD THE BACK SIDE OF IT CAUSE THESE ARE ACTUALLY GONNA ACT AS MY PLACE HOLDERS FOR WHEN I PUT THIS WHOLE THING BACK UP IN PLACE. THEN I CAN WELD THAT. LAY DOWN ONE OF THESE THICK PLATES THAT COME WITH THE KIT SO THAT OUR FOOTING WILL BE THICK ENOUGH TO PASS INSPECTION. THE TOP OF THE TUBE YOU WANT TO MAKE SURE TO PLACE THE BAR PARALLEL WITH THE APILLAR. THAT WAY WHEN SITTING IN THE CAR IT'S NOT REALLY OBSTRUCTING ANY OF YOUR VIEW. YOU WANT TO KEEP IT OUT OF YOUR LINE OF SIGHT. ALSO IT'S OKAY TO PLACE THE TUBE ON THE OUTSIDE OF THE RADIUS OF YOUR BEND. THAT WAY IT GAINS YOU A LITTLE ROOM AROUND YOUR STEERING WHEEL. THIS FRONT GLASS IS ATE UP AND WAS GONNA GO AWAY ANYHOW. NOW'S A GOOD TIME TO CHUCK IT. IS TO USE A GRINDER. IT LETS YOU HAVE A LOT OF FREEDOM WHEN IT COMES TO THE SHAPE OF YOUR NOTCHES. IT LOOKS LIKE THAT FITS PRETTY GOOD. NOW I'VE GOT TO PUT OUR PLATE IN. TRIM OFF JUST A LITTLE FOR IT, MARK WHERE WE WANT THE PLATE TO GO, AND BURN IT INTO PLACE. FIRST I'M GONNA BURN AWAY SOME OF THE OLD SEAM SEALER SO I DON'T HAVE TO FIGHT WITH IT WHILE I'M TRYING TO WELD. WITH THE TOP OF THE PLATE BURNED IN, I'LL HEAT AND BEND THE REST OF IT TO MATCH THE CONTOURS OF THE FLOOR. AND AS DIFFERENT POINTS MAKE CONTACT I CAN WELD THEM TO THE FLOOR, THEN CONTINUE SHAPING THE PLATE. I CAN SET MY TUBES INTO PLACE AND POP IT IN, AND CHECK TO MAKE SURE MY DOOR AND WINDOWS WORK LIKE THEY'RE SUPPOSED TO. ONCE I KNOW THAT, I'LL BURN IT IN REAL NICE, SWEET! UP IN THIS THING. ALL WE LACK IS A FEW MORE TUBES. SHOOT, WHEN WE'RE DONE THIS THING'S GONNA BE TOUGHER THAN WOODPECKER LIPS. INTO YOUR RACE CAR. THEN RIDE ALONG WITH THE GUYS AND SEE WHAT 60 ACRES OF MOPARS LOOKS LIKE. 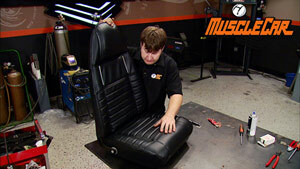 (RICK)>> HEY GUYS, WE'RE READY TO KEEP MOVING FORWARD ON INSTALLING THE ROLL CAGE INTO OUR DODGE. WE'VE GOT THE MAIN HOOP, SEAT BARS, REAR BARS, HALO, AND APILLAR BARS ALL TACKED INTO PLACE. NOW WE NEED TO INSTALL THE FLOOR BARS. NOW THESE ARE REQUIRED IF THE FLOOR'S BEEN HEAVILY MODIFIED OR ELIMINATED. I THINK THIS CAR FALLS INTO THAT CATEGORY. NOW THIS'LL HELP TIE THE BACK END INTO THE FRONT END. PLUS IF THIS THING EVER TRIES TO CRAWL OVER A GUARD RAIL LIKE A SPIDER MONKEY, IT'LL GIVE US A LITTLE BIT OF EXTRA PROTECTION. JUST LIKE WE DID WITH THE OTHER BARS, WE'LL CUT IT DOWN TO SIZE. THEN USE A GRINDER TO NOTCH IT, GIVE IT A NICE FIT. I THINK I WANT TO GET THE GAUGES INSTALLED, GET THE NEW DASH, GET THE REST OF THAT STUFF IN PLACE, AND THEN WE'LL DEAL WITH THAT BAR. BUT THERE IS ONE LAST THING THAT WE CAN DO TO OUR ROLL CAGE AND THAT'S INSTALL A SWING OUT KIT. BACK ON IT BUT DOWN LOW ENOUGH THAT IT'S NOT GONNA CATCH ON YOUR QUARTER PANEL EITHER. NOW ANYTIME YOU WANT TO MAKE A NICE STRAIGHT CUT ON A TUBE LIKE THIS, A NICE LITTLE TRICK IS TO USE A HOSE CLAMP, BECAUSE A HOSE CLAMP IS GONNA CENTER ITSELF ON THAT TUBE. THAT WAY YOU KNOW YOU'VE GOT A STRAIGHT CUT. I'LL START THE CUT USING A BIG GRINDER WITH A CUTTING WHEEL ON IT BUT I'M GONNA SWITCH TO A SMALLER ONE TO FINISH IT. THE TUBE MAY MOVE AND I DON'T WANT THAT BIG GRINDER TO BIND UP AND PLANT A COUPLE OF HUNDRED CUTTING AND LITTLE SHARDS IN MY FACE. NOW YOU CAN KINDA SEE WHERE THE BOLD IS GONNA GO THROUGH THERE AND ACTUALLY FORM THE HINGE, WHICH IS GONNA LET THAT BAR COME OUT. THAT MEANS THAT I NEED TO GO DRILL A HOLE AND INSTALL MY SLEEVES. NOW WITH THE HOLE DRILLED FOR THE SLEEVE I CAN BURN IT ALL IN. NOTCH OUT THE END OF THE TUBE TO GIVE IT ROOM TO SWIVEL ON THE HINGE. THEN WE CAN POP IN THE LATCH AT THE TOP, MARK THIS END, AND INSTALL THE SLEEVE. WE GOT IT IN THERE NICE AND SMOOTH AND IT OPENS AND SHUTS WITH NO PROBLEM. THAT'S GONNA MAKE GETTING IN AND OUT OF THIS THING A HECK OF A LOT EASIER. NOW THAT'S ABOUT AS FAR ALONG AS WE CAN GO WITH THE ROLL CAGE FOR NOW UNTIL WE GET THE DRIVETRAIN IN, WHICH AS I MENTIONED EARLIER, WE DON'T HAVE YET. BUT I CAN GIVE YOU A HINT AS TO WHAT WE'RE GONNA BE PUTTING IN THAT ENGINE COMPARTMENT. IT STARTS WITH AN "H" AND ENDS WITH "EMI". (ANNOUNCER)>> COMING UP, IT'S THE BIG MOPAR GRAVEYARD IN THE SKY. WELL ACTUALLY IT'S IN ALABAMA! LIKE TO CALL BUSINESS TIME. 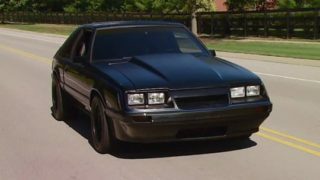 (TOMMY)>> ONE OF THE THINGS WE'RE LOOKING FOR IS A PAIR OF BUCKET SEATS CAUSE WE WANT TO KEEP OUR CAR ALL DODGE INSTEAD OF DOING IT THE EASY WAY AND JUST THROWING IN A PAIR OF RACE SEATS. BUMPERS OUT FOR '73 AND EARLIER STYLE. THE WORLD'S LARGEST VINTAGE MOPAR SALVAGE OPERATION. THEY'VE BEEN RECYCLING OLD SCHOOL DODGES AND PLYMOUTHS SINCE 1976. IF ANYBODY CAN HOOK US UP WITH THESE PIECES, WE KNOW THEY'VE GOT US COVERED. (RICK)>> AND THE GUY WHO HOLDS THE PINK SLIPS TO SOME OF THE COOLEST CARS ON THE PLANET IS THIS GUY RIGHT HERE, MISTER TED STEPHENS. HOW ARE YOU DOING MAN? (TED)>> GOOD RICK, NICE TO MEET YOU. VINTAGE MOPAR DISMANTLING ON EARTH, HOW MANY ACRES ARE YOU GUYS TAKING UP? (TED)>> RIGHT NOW WE'RE AT 58. IT STARTED AT FIVE, AND THEN IT'S GROWN STEADILY SINCE THEN. (RICK)>> A PRETTY GOOD SIZE CHUNK OF DIRT, HOW MANY CARS DO YOU HAVE ON THERE? (TED)>> SOMEWHERE BETWEEN TWO AND THREE THOUSANDS. DARTS, DEMONS, DUSTERS, CHALLENGERS, CHARGERS, CUDAS, FURY'S, YOU NAME IT, FROM 1962 TO 1974, WE'VE GOT IT. (RICK)>> IF MOPAR MADE IT, YOU'VE GOT IT. 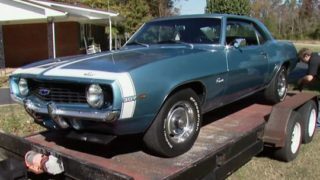 (TOMMY)>> WELL LETS SNEAK OUT TO THE YARD AND SEE WHAT WE CAN FIND FOR OUR OLD DART, WHAT DO YOU THINK? (TOMMY)>> ALRIGHT, AFTER YOU SIR. (RICK)>> OH MAN, TED, IS THAT WHAT I THINK IT IS? (TED)>> YEP, THAT'S A REAL DAYTONA KILLED BY A CEMENT TRUCK IN GADSDEN, ALABAMA, IN 1971. I BOUGHT IT FROM A GUY THAT WAS USING IT FOR A YARD ORNAMENT. SO WE'RE BASICALLY DOING THE SAME THING. HIT SO HARD IN THE RIGHT FRONT, DROVE THE SPINDLE UP TO THE ROCKER PANEL, WRINKLED THE ROOF AND EVERYTHING ALL UP. YOU KNOW, IT WASN'T REPAIRABLE WHEN THIS HAPPENED. (RICK)>> SO IT'S BEEN SITTING LIKE THIS SINCE 1970? (TOMMY)>> IF YOU THINK THAT THE SAME INVENTORY HAS BEEN SITTING AROUND HERE SINCE THE '70'S GETTING PICKED APART, THINK AGAIN. THEY'RE CONSTANTLY ON THE HUNT FOR FRESH CARS. THIS THE ONE? I THINK THIS SET HERE WILL WORK GOOD. THEY'RE OUT OF A '72 MODEL. THEY'VE GOT THE RIGHT TRACKS AND EVERYTHING ON IT, SO IT SHOULD WORK OUT WELL. SINCE WE'RE BUILDING KIND OF A CUSTOM CAR HERE, WE DON'T HAVE TO BE SO YEAR SPECIFIC. (TOMMY)>> NO, NO, I'LL GET THIS ONE. (TED)>> GET THAT ONE TOMMY! (TOMMY)>> HA, HA, THEY REALLY DON'T LOOK THAT BAD. ALL THEY NEED IS A SET OF COVERS ON IT AND THEY'D LOOK GOOD. (RICK)>> THIS ONE WORKS, WE JUST NEED A CAR TO PUT AROUND IT. NOW ONE THING THAT REALLY SETS STEPHEN'S APART FROM YOUR AVERAGE WRECKING YARD IS THESE GUYS DON'T JUST CHOP CARS UP TO GET WHAT THEY NEED. THEY'RE MORE LIKE SURGEONS. THEY VERY CAREFULLY DISMANTLE THESE THINGS AND SAVE EVERY LITTLE BIT AND PIECE CAUSE YOU NEVER KNOW WHAT THE NEXT GUY'S GONNA NEED. ( )>> WHERE DO YOU WANT IT? (RICK)>> THANK YOU MUCH SIR. ( )>> YOU'RE WELCOME. (RICK)>> HOLY COW, PUT THIS THING ON A DIET. EVEN THE GUYS THAT WORK HERE ONLY HAVE EYES FOR MOPARS, AND OLE REX HERE. (REX)>> THE REST OF THEM'S JUNK. (RICK)>> WELL HE LOVES THESE THINGS. (TOMMY)>> WE FOUND THE BUMPERS AND SEATS WE WANTED, BUT THERE'S NO WAY THAT WE COULD LEAVE WITHOUT LOOKING AT SOME OF THE OLD CARS, AND TALKING TO TED ABOUT SOME OF HIS UNIQUE PIECES. (TED)>> UP THERE ON TOP OF THE HILL WE'VE GOT A '70 440 SIX PACK CHALLENGER, PLUM CRAZY PURPLE. THIS IS A '72 CHALLENGER RALLY. THESE CARS HAD THE UNIQUE STRIPE PACKAGE THAT STARTED IN A SCOOP THAT WAS MOUNTED ON THE FENDER HERE, RAN BACK ON THE FENDER ONTO THE DOOR. I'LL SHOW YOU WHAT IT LOOKED LIKE ON THE DOOR RIGHT DOWN HERE. AND THIS IS WHERE IT COMES BACK ONTO THE DOOR HERE, RUNS DOWN THIS DOOR HEADING TOWARD THE QUARTER PANEL. (RICK)>> THERE'S A STORY IN HOW EVERY SINGLE ONE OF THESE CARS ENDED UP HERE, AND MAN WE WISH WE HAD TIME FOR ALL OF THEM. BUT WE DID MANAGE TO BURN THE WHOLE DAY ON THE ONES THAT WE COULD. (TOMMY)>> I THINK THESE PARTS ARE GONNA THROW SOME LIFE BACK INTO OUR OLD DODGE, AND IT'S A GOOD THING THERE'S PEOPLE AROUND LIKE MISTER TED THAT'S KEEPING THESE DODGES ON THE ROAD. I WANT TO SAY THANK YOU. (TED)>> TOMMY, COME BACK ANY TIME, I'D BE GLAD TO HELP YOU WITH YOUR MOPAR NEEDS. AND CHECK IT ALL OUT. BUT FOR THIS WEEK WE'RE OUT OF TIME, SO UNTIL NEXT TIME, WE'RE OUTTA HERE.